Located on the outskirts of historical Teruel, it perfectly expresses the mixture of cultures and styles of this interesting monumental city which conceals some of the most representative buildings of Mudejar art. This small Mudejar inspired palace also combines numerous styles and lines in its construction. Marble, tiling, pointed arches and Arabic details form the essence of cheerful and bright rooms, decorated in pastel shades. It also has a spacious garden, where the swimming pool and tennis court can be found, and rooms suitable for holding conferences, work meetings or social functions. 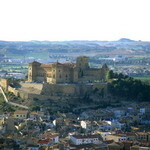 Built on the hill top called the Cumbre de Cerro Pui-Pinos, this 12th-13th century castle-convent became the seat of the Order of Calatrava in 1179. Dominating the landscape of the Maestrazgo, it conserves the keep, the bell tower-sacristy and the part reconverted into an 18th c. Aragonese palace. Gothic walls, plateresque tomb and baroque façade are inserted into an interior with soft, red and green coloured shades, adorned with Spanish wood in furniture and beams. It also features a peaceful garden. A good number of trips and activities related to adventure sports can be organized from the Parador. Of Aragonese character, the building conserves the monumental, historical and artistic atmosphere of Sos del Rey Católico. The town, declared a Historical-Artistic area, was the birthplace of influential nobles and of the Catholic King, and the influence of the Aragonese and Navarrese foothills of the Pyrenees can be made out in its landscape. 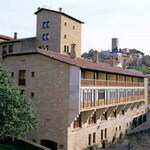 It is an appropriate setting to discover this medieval town and to visit areas of immense beauty. The regal and elegant interior offers beautiful views of the town from some rooms. Wood covers interior columns and predominates in the Castilian style furniture. Space and light are a common feature in the bedrooms, thanks to their large windows. This welcoming mountain hut is located in one of the now classical enclaves for outdoor sports and activities, the western slopes of the Ordesa National Park and Monte Perdido, declared a World Heritage Site by Unesco in 1997. 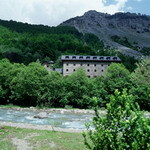 The pure air of the Pyrenees and of the Monte Perdido, the clean waters of the river Cinca and the tradition of the Romanesque hermitage of Nuestra Señora de la Pineta, offer a warm feeling of well-being, peace and quiet. Floors, walls, beams and columns lined with wood contain modern and comfortable furniture. The bedrooms have beautiful views of this lovely natural enclave. MeTripping - a one stop travel search engine to discover, research and book your next vacation! Exotic destinations, stunning hotels and ideal flights - ranked to suit your interests and budget! Go MeTripping now!